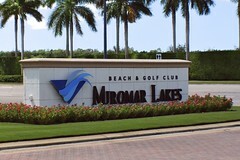 Miromar Lakes (Miromar Lakes Beach & Golf Club) is the #1 Community in the United States and #1 Clubhouse; awarded the Gold Awards for Community of the Year and Best Clubhouse by the National Association of Home Builders. The only Florida community in history of the NAHB awards to receive these building industry top honors. Close to Shopping at Miromar Outlets, Gulf Coast Town Center, minutes away from Southwest Florida International Airport & I-75 highway! Located directly on the water’s edge, the Beach Clubhouse offers gourmet evening dining indoors or under the stars with seating for 250 people, an indoor/outdoor lounge with wine room, a library, billiard room, card room, 50-seat theater and a business center. A private “beachside” dining room provides intimate seating around a fireplace and has French doors that open up to the beach and Lake Como. Resplendent in its design, the private par-72 Championship Golf Course provides a premier golfing experience. Designed by master architect, Arthur Hills, it is his only ‘Signature’ course in Southwest Florida. Totaling 7,400 yards of natural splendor with TifEagle Bermuda greens, it features six sets of tees to challenge players of all levels. A challenge for all pros and amateurs alike are raving about this 7,400 yards of heaven. Extensive berming and picturesque landing areas overwhelm you with the feeling of total exclusivity. Our 15 acre practice facility includes a driving range, practice fairway bunkers, dedicated chipping green with bunkers, and a 9,000 square foot TifEagle practice green, all maintained year-round to “Signature” course standards. The Spa combines the best of traditional and innovative therapies that will stimulate your mind, body and spirit. At the Spa, wrap yourself in luxury in a Miromar Spa robe and surrender to seemingly endless pampering. Indulge yourself with a comprehensive menu of massage and spa therapies in one of our soothing treatment rooms or outdoors, in, a private Zen garden. Members and their guests will appreciate the professional and courteous service provided by our attentive staff. Our European-Style Spa offers a full range of massage therapies, facials, body wraps and salt-glow scrubs, plus a full service beauty salon. The Fitness Center features top-of-the-line Cybex weight training machines, cardiovascular equipment with individual TV monitors, aerobics, yoga and Pilates studios. Beyond the beauty of the architecture and lush landscaping at Miromar Lakes, you will find a dynamic, vibrant lifestyle! Miromar Lakes’ various venues cultivate a wide variety of activities for adults and children, making it a very social atmosphere for all age groups and families. Throughout the year more than 300 events fill the calendar! Check out my Gated Community Resource Guide that includes detailed information about Miromar Lakes, including association fee amounts and what comes with community dues. Contact me for more info about this beautiful community! You can check out all available homes for sale in this community, 24-7 here: Miromar Lakes – Fort Myers, FL 33913, including this great deal 18041 Montelago Ct! Posted on February 7, 2013, in Real Estate and tagged Aerobics, Beachside, Buy a Home, Buyer, Cybex, European-Style, Fitness Center, Fort Myers, Gated Community, Gated Community Resource Guide, Golf, http://www.kristenpell.com/idx/index.php, Kristen Pell, Miromar Lakes, Miromar Lakes Beach & Golf Club, Par-72 Championship Golf Course, Pilates, Property Guiding, Real Estate Biz, Realtor, Signature Course, Six Tees, Spa, SWFL Real Estate, TifEagle Bermuda Greens, Yoga. Bookmark the permalink. 3 Comments. Nice work on the Miromar Blog!